We always get very excited when we see a new GPU architecture come down the pipe from ATI or NVIDIA. For the past few years, we've really just been seeing reworked versions of old parts. NV40 evolved from NV30, G70 was just a step up from NV40, and the same is true with ATI as well. Fundamentally, not much has changed since the introduction of DX9 class hardware. But today, G80 ushers in a new class of GPU architecture that truly surpasses everything currently on the market. Changes like this only come along once every few years, so we will be sure to savor the joy that discovering a new architecture brings, and this one is big. These massive architecture updates generally coincide with the release of a new DirectX, and guess what we've got? Thus we begin today's review not with discussions of pixel shaders and transistors, but about DirectX and what it will mean for the next-generation of graphics hardware, including G80. There has been quite a lot of talk about what DirectX 10 will bring to the table, and what we can expect from DX10 class hardware. Well, the hardware is finally here, but much like the situation we saw with the launch of ATI's Radeon 9700 Pro, the hardware precedes the new API. In the mean time, we can only look at our shiny new hardware as it performs under DX9. Of course, we will see full DX9 support, encompassing everything we've come to know and love about the current generation of hardware. Even though we won't get to see any of the new features of DX10 and Shader Model 4.0, the performance of G80 will shine through due to its unified shader model. This will allow developers to do more with SM3.0 and DX9 while we all wait for the transition to DX10. In the mean time we will absolutely be able to talk about what the latest installment of Microsoft's pervasive graphics API will bring to the table. One of the major performance improvements we will see from DX10 is a reduction in overhead. Under DX9, state change and draw calls are made quite often and can generate so much overhead that the API becomes the limiting factor in performance. With DX10, we will see the addition of state objects which hold all of the state information for a given pipeline stage. 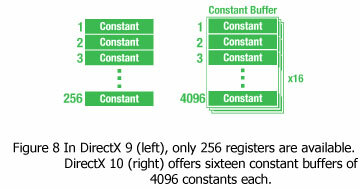 There are 5 state objects in DX10: InputLayout (vertex buffer layout), Sampler, Rasterizer, DepthStencil, and Blend. These objects can quickly change all state information without multiple calls to set the state per attribute. Constant buffers have also been added to hold data for use in shader programs. Each shader program has access to 16 buffers of 4096 constants. Each buffer can be updated in one function call. This hugely reduces the overhead of managing a lot of input for shader programs to use. Similar to constant buffers, texture arrays are also available in order to allow for much more data to be stored for use with a shader program. 512 equally sized textures can be stored in a texture array, and each shader is allowed 128 texture arrays (as opposed to 16 textures in DX9). The combination of 8Kx8K texture sizes with all this texture storage space will offer a huge boost in texturing ability to DX10 based games and hardware. A new construct called a "view" is being introduced in DX10 which will allow resources to be used as more than one type of thing at the same time. For instance, a pixel shader could render vertex data to a texture, and then a vertex shader could use a view to interpret the data as vertex buffer. Views will basically give developers the ability to share resources between pipeline stages more easily. There is also an DrawAuto call which can redraw an object without having to go back out to the CPU. This combined with predicated rendering should cut down on the overhead and performance impact of large numbers of draw calls currently being used in DX9. What we know right now is that 8800 gets a 128 out of 130 on HQV tests. "It isn't surprising to see that NVIDIA's implementation of a unified shader is based on taking a pixel shader quad pipeline, and breaking up the vector units into 4 scalar units. Now, rather than 4 pixel quads, we see 16 SPs per "quad" or block of stream processors. Each block of 16 SPs shares 4 texture address units, 8 texture filter units, and an L1 cache." If i understood well this sentence tells that given 4 pixels the numbers of SPs involved in the computation are 16. Then, this assumes that each component of the pixel shader is computed horizontally over 16 SP (4pixel x 4rgba = 16SP). But, are you sure?? Honestly, NVIDIA wouldn't give us this level of detail. We certainly pressed them about how vertices and pixels map to SPs, but the answer we got was always something about how dynamic the hardware is able to dynamically schedule the SPs optimally according to what needs to be done. They can get away with being obscure about how they actually process the data because it could happen either way and provide the same effect to the developer and gamer alike. Scheduling the simultaneous processing one vec4 MAD operation on 4 quads (16 pixels) over 4 groups of 4 SPs will take 4 clock cycles (in terms of throughput). Processing the same 16 pixels on 16 SPs will also take 4 clock cycles. But there are reasons to believe that things happen the way we described. Loading components of 16 different "threads" (verts, pixels or whatever) would likely be harder on the cache than loading all 4 components of 4 different threads. We could see them schedule multiple ops from 4 threads to fill up each block of shaders -- like computing 4 consecutive scalar operations for 4 threads on 16 SPs. At the same time, it might be easier to maximize SP utilization if 16 threads were processed on one block of SPs every clock. This has been AT's best article in awhile. Tons of great, concise info. if they don't they likely adjusted for a gamma of either (or between) 2.2 or 2.5. Also, thanks :-) There was a lot more we wanted to pack in, but I'm glad to see that we did a good job with what we were able to include. This comment is unrelated, but could you implement some system where after rating a comment, on reload the page goes back to the comment I was just at? Otherwise I rate something halfway down and then have to spend several seconds finding where I just was. Just a little nuissance. If manufacturers go with the NVIDIA reference design, then we will see a nice large heatsink with a huge quiet fan. Really, it does move a lot of air without making a lot of noise ... Are there any devices we can get to measure the airflow of a cooling solution? We are also seeing some designs using water cooling and theres even one with a thermo-electric (peltier) cooler on it. Manufacturers are going to great lengths to keep this thing running cool without generating much noise.